For all of your landscaping & hardscaping needs. Based in Northampton, PA, LV Outdoor Innovations is the landscaping & hardscaping division of Lehigh Valley Home Innovations. 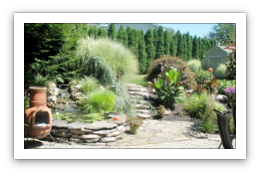 Lehigh Valley Outdoor Innovations provides professional landscape design services to residents & busniesses in the Lehigh Valley. We incorporate every element of landscape design utilizing, custom lighting, irrigation, patio, and outdoor living spaces, as well as waterscapes to capture our client’s dream, from project conception to the final details. Whether you are replacing old pavers or revamping your current outdoor living space, LV Outdoor Innovations can help! We welcome small and large projects and have seasonal contracts available.